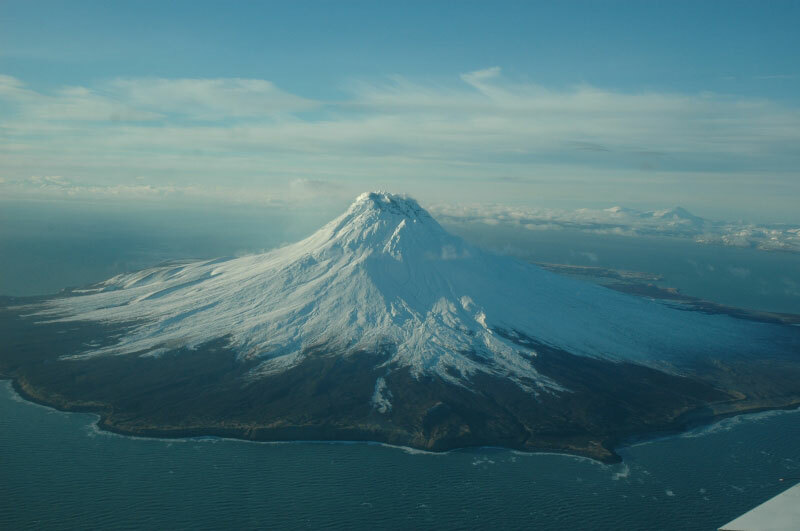 Augustine volcano, Alaska, is showing more and more unrest and the Alaskan Volcan Observatory announced an increase of alert level to ORANGE, which means that an eruption is considered possible within a short time. Since May 2005, seismic activity at Augustine has been gradually increasing. The increase in earthquakes located directly under the summit of the volcano has also been accompanied by a detectable swelling (up to a total of 5 cm as in early Jan) of the volcano. In early and mid December, a number of small steam explosions were recorded by seismic instruments on the volcano. Views of the summit following these explosions revealed new steaming cracks and localized deposits of debris. In addition, airborne gas measurements and thermal imaging measurements have shown an increase in the output of volcanic gas and heat at the summit of the volcano. The highest temperature recorded, on January 4, was 390 C (750 F). AVO interprets these changes as a sign that new magma is accumulating beneath the volcano's summit. Based on an analysis of past and current earthquake locations, GPS, gas, and heat data, this new magma may have risen to sea level or higher. Source: adapted from information on the AVO's website (11 Jan). 1) Failed Eruption: No eruption occurs as magma does not reach the surface. Earthquake activity, ground deformation, gas output, and steaming slowly decrease over several weeks or months. 2) Eruption similar to those of 1976 and 1986: Unrest continues to escalate culminating in an eruption that is similar to those that occurred in 1976 and 1986. An eruption such as this would likely spread volcanic ash throughout and perhaps beyond Cook Inlet depending upon the prevailing winds. Much of Augustine Island would be inundated by pyroclastic flows, mud flows, ash fall, and ballistic showers. 3) Larger Explosive Eruption: A significantly larger eruption could occur, perhaps similar to eruptions that are thought to have taken place prehistorically. Such an eruption might involve the production of larger ash plumes, significant modification of the island's summit, and large pyroclastic flows and mud flows on the island. 4) Flank Collapse: The intruding magma or other processes could destabilize a portion of the Augustine cone that could result in a large landslide. If this landslide entered Cook Inlet, a localized tsunami could be generated. Such a landslide and tsunami were associated with the 1883 eruption of Augustine Volcano. It is also likely that a landslide of this type would be accompanied by an eruption. Based on all available monitoring data AVO, regards scenario number two, an eruption similar to those in 1976 and 1986, as the most probable outcome at this time. At this time scenarios one, three and four are considered less likely. AVO will continue to monitor the volcano closely. We plan to add additional instrumentation on the volcano to help us better understand the nature of this unrest. New data and observations may lead us to change our assessment. Any changes would be announced in a subsequent Information Release. The two volcano tours on Hawai'i have come to an end, or better, the time to enjoy these fresh memories has now started. We look back on 10 days packed with impressions from exceptional activity at Kilauea volcano,- we have been incredibly lucky both as to activity (Kilauea was/still is in one of its most active phases since the start of the eruption in 1983), and the weather and last but not least thanks to the great mix of people we have had on board. Not only got we to see lots of lava during the 5 days each, but we also had our great share of fun, met interesting new people from all over and did many other interesting and nice activities aside. Tom took many photos, some of which will soon be available (mainly on www.decadevolcano.net). Due to the sucess of the tour, the VolcanoDiscovery Hawai'i team (Tom, Phil and Philippe) can offer to repeat the tour for individuals or small groups at almost any date on request, in English and/or French as well as Portuguese. In addition, two new fixed dates, now open for inscriptions, are now set up for mid November: 13-18 and 20-25 November, 2005. Details of the tour can be found at this page. (Since Tom will be on location as well during these tours, the languages the tour can be done, are: German, English, French, Danish, Italian, Greek and Portuguese or a mix of these). Kilauea is erupting a lot of lava and the expedition is a huge sucess (so far)... Two active ocean entries, uncountable breakouts on the flowfield and the upper slopes as well as an intense activity at and around the Pu'u O'o cone are present. Tom and his small group are on location,- more photos and reports will be posted when time permitting. After weeks of intense work, the new website of VOLCANO DISCOVERY is finally online and the small company has found its virtual "home". I am now running VOLCANO DISCOVERY together with my friend and partner Tobias Schorr, whom some of you might know from Methana already.